Line fishing from an outrigger paddled canoe. The sheer is quite flat, except for a bit of rise at the bow. The bow itself rises out of the water. The outrigger booms are strongly curved, unlike the booms in most of the images below. 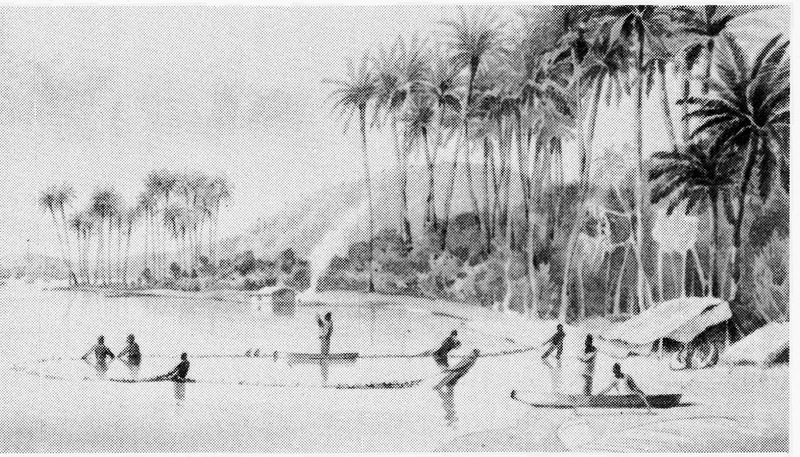 A lovely beach scene with Tahitians fishing with a seine and a canoe pulled up on the shore. Detail of the above painting, magnified as much as resolution allows. The forward boom of this outrigger canoe is connected to the outrigger float by struts, while the after boom curves downward to connect to the float directly. The extension of the bow appears to be an addition, not carved from the trunk of the hull. Another scene in which seine fishing from shore is aided by canoes to bring the net out. Because of the man standing in the water, it's hard to tell if the "bowsprit" belongs to the boat in the foreground or the one behind it. The quadrilateral sail is supported by a mast, boom, and sprit. As in the previous image, the sterns are upturned sharply. Detail of the previous image. The bowsprit seems quite thin, and it has no supporting rigging, but is apparently strong enough to support the child's weight without sagging. 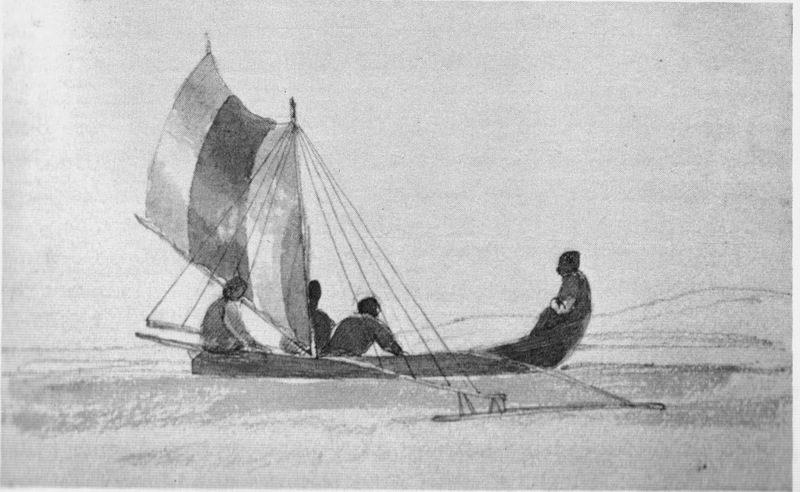 This quicker, looser watercolor sketch shows the same features as the previous few images (upturned stern, plumb bow, "bowsprit," quadrilateral sail with three spars, and outrigger float connected directly to the boom in the rear, and with struts in the front), but adds another detail: multiple shrouds supporting the mast. All of them attach at the same point on the mast. To port, the lower ends attach to the forward outrigger boom at regular intervals. To starboard, they attach to a boom that serves both as an attachment point for the shrouds, and for hiking out (as seen in the next image). The top boat in this image is very similar to the previous image and may be just a slightly refined version, except that a crewman is clearly seen hiking out on the starboard boom. The arrangement of struts connecting the float to the forward port boom is clear: four struts in two pairs of inverted V's. The bottom boat seems to have elements of Western boat design. The hulls of the canoes in the background are similar to the preceding ones, but the sailing rig hoists a squaresail: this was probably an adoption of a Western type. A paddled dugout canoe with a nicely carved cutwater and fine shaping and finishing all over the hull. Its shape is rather different from the paddled dugout shown at the top of this post. The paddle has a teardrop-shaped blade and no end-grip on the shaft. 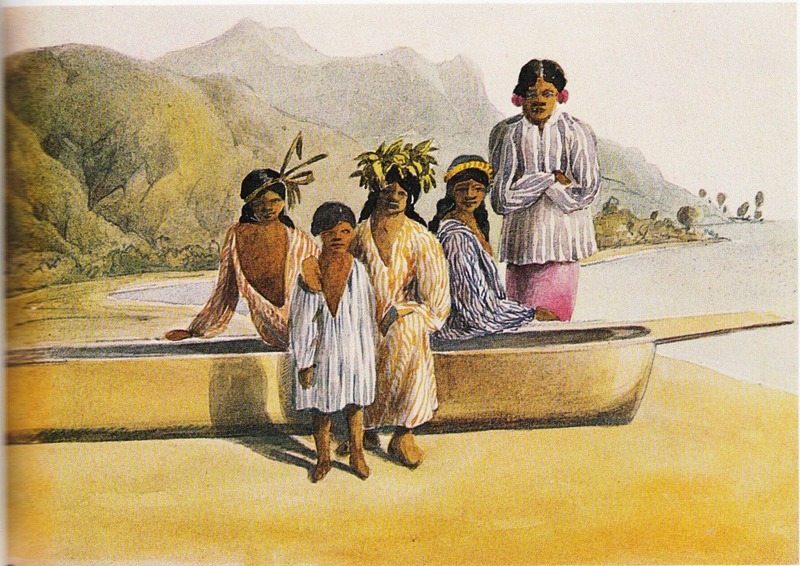 Images from: The Polynesian Journal of Captain Henry Byam Martin, R.N. In command of H.M.S. 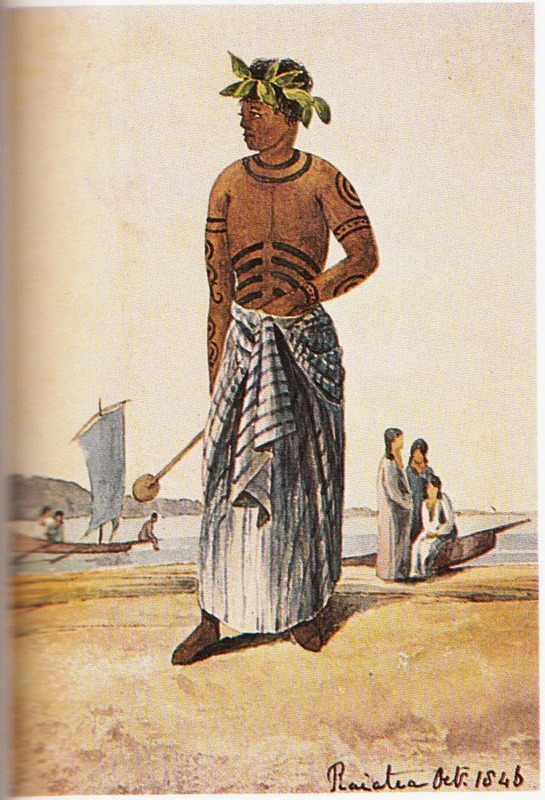 Grampus -- 50 guns, at Hawaii and on station in Tahiti and the Society Islands, 1846-1847. In 1846, the British Admiralty dispatched HMS Grampus, 50 guns, under command of Capt. Henry Byam Martin, RN, to the Society Islands. 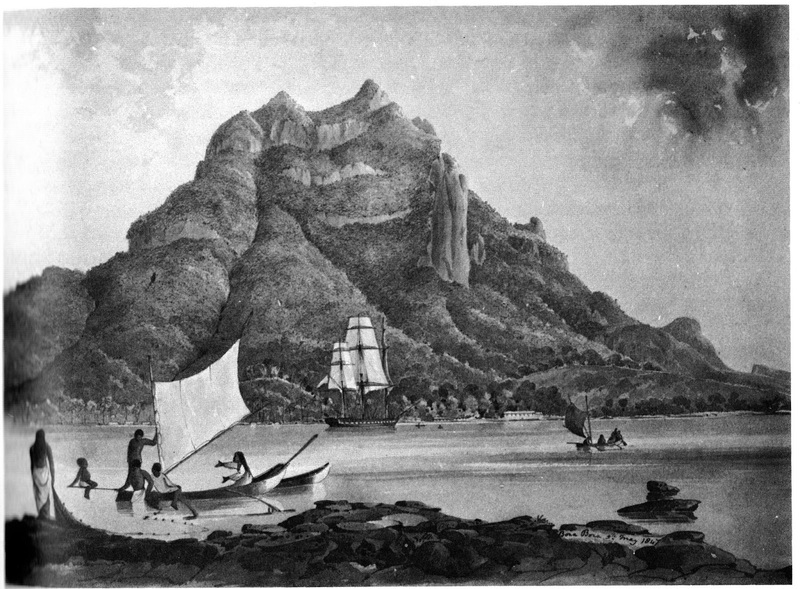 The French had just named Tahiti a protectorate, to the chagrin of the British (who might earlier have taken the islands for themselves had they been so motivated) and the violent opposition of the Tahitians. 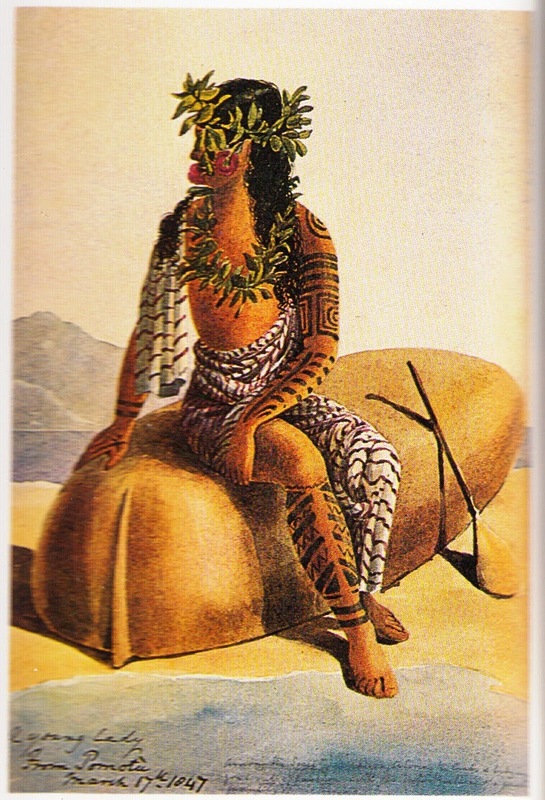 Martin's brief was to observe the French activities (i.e., spy) , and if possible throw a wrench in the works of the nascent protectorate through diplomacy with the Tahitian chiefs, while avoiding anything that the French would construe as overtly unfriendly action. During his year on station, Martin kept a personal journal in which he made numerous watercolor paintings and sketches, and recorded occasional notes, about native watercraft. Gardner (A.B.) died of dysentery. I heard today sundry evidences of lurking discontent among the people, but it is too late they are subdued -- for the present at least. I walked to Taonoa to see a remarkable double canoe from the Pomatoo islands. It is in fact 2 canoes joined together. Each is about 50 feet long by 5 broad. There is not a nail in them. The logs of which they are constructed are sewn together with bark -- and the joinings are close & neat. The upper works or gunwales are of matting. She is schooner rigged with her masts stepped on the thwarts or connecting boards and I am told these craft stand a great deal of bad weather. Thirty eight persons crossed in her from Pomotoo -- about 250 miles. They seem to be families who have come to see what is to be seen and picked up. The women & children are hideous -- they have thrown up some huts round their canoe, which is hauled up high & dry. These people had with them a curious bat or vampire, which I would have bought if he had stunk a little less. The head, in size form & colour much resembled a ferret's. Each foot had 5 claws -- its wings were of great spread & each had at its extremity a claw or hook. I believe this animal is called the flying fox. 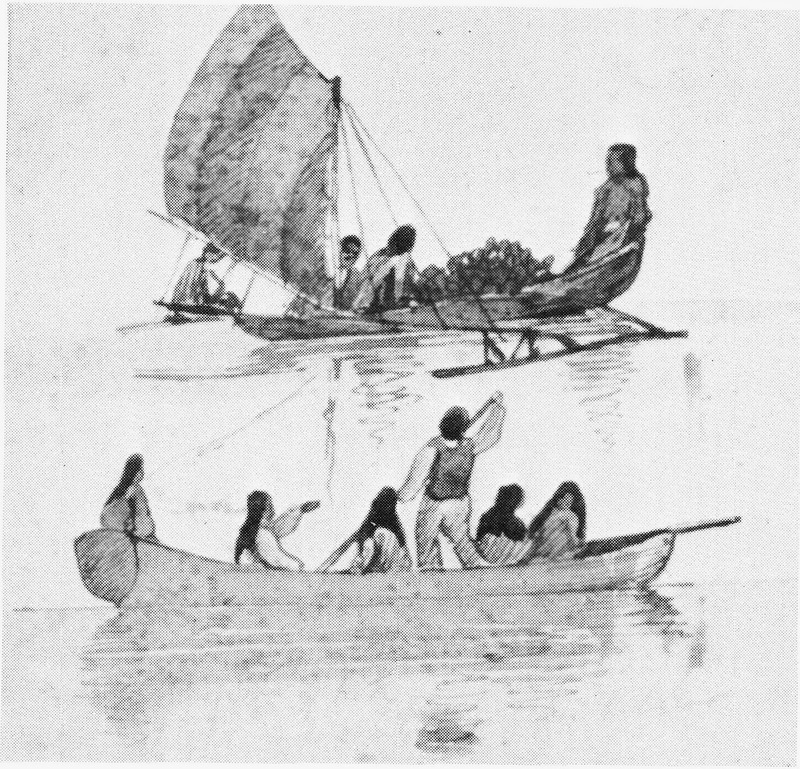 Tuamoto double canoe, plan view. Even aside from its sewn construction, the canoe is remarkable. Most double canoes have their hulls separated by cross-beams, but this one has the hulls right up against each other. Separated hulls impose great stresses on the cross-beams and on the attachments between the cross-beams and the hulls. These stresses are minimized by placing the hulls next to one another, but I suspect this merely substitutes one engineering problem for another. In this configuration, the hulls themselves, and their sewn fastenings, would be subject to great stress as they press against each other. Since it is unlikely that the hulls had internal frames, it's hard to fathom how these large sewn hulls did not crush one another as the boat worked in a seaway. Evidently, they did not. On first glance, the larger drawing appears to show the canoe's bow, with graceful double beakheads. But as I pondered the huge, strangely-shaped bowsprit, I realized that we're looking at the stern, and the "bowsprit" is actually a steering oar. On closer examination, the "beakheads" are supporting a cambered wooden deck. The platform running the whole length of the outside of the starboard hull looks like a fine place to relax when sailing in good conditions. It's supported by numerous timbers which presumably go right through the hull, although they are not shown in Martin's simple plan view. The hulls appear to be covered with draped woven matting (probably of pandanus leaves) which serves for weather protection, in place of a permanent house structure. Martin says the boat was schooner rigged, and this appears so much the case that it's a little baffling. 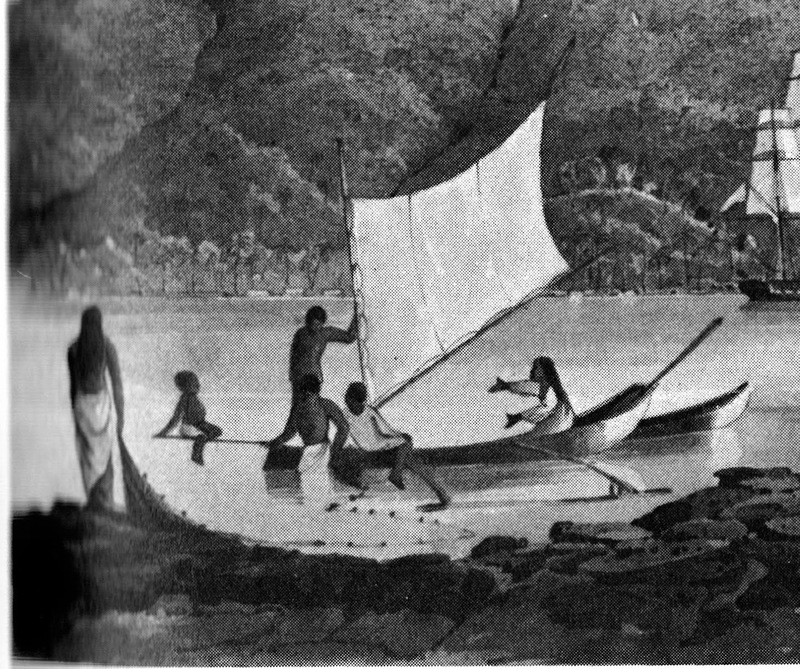 At that time, Tahitians were adopting elements of Western rigs piecemeal to their canoes (of which, more in a future post), and it's surprising that the even more remotely-situated Tuamotans would be using a schooner rig that any contemporary New Englander would have recognized. In any case, the foremast appears to be shorter than the mainmast, but this may be a trick of perspective and the two might be equal in height. The foremast appears to have a gaff, and the mainmast a horizontal boom. The baskets and other items hanging from the rigging were probably for food storage, to keep them away from vermin and surreptitious snitching by unauthorized crew. 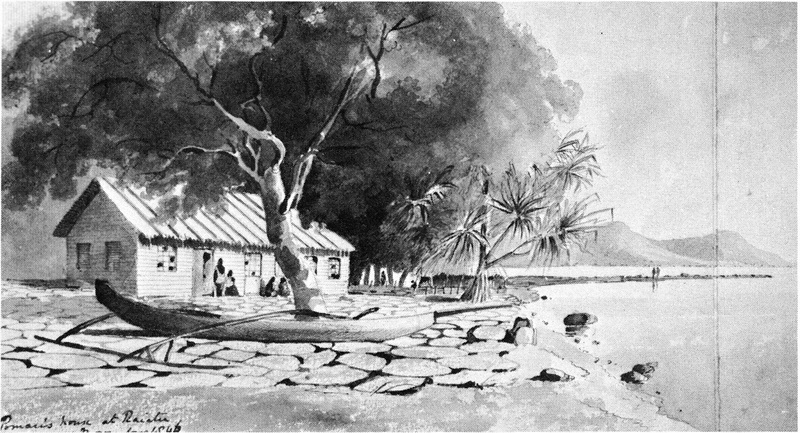 Images and quotation from: The Polynesian Journal of Captain Henry Byam Martin, R.N. In command of H.M.S. 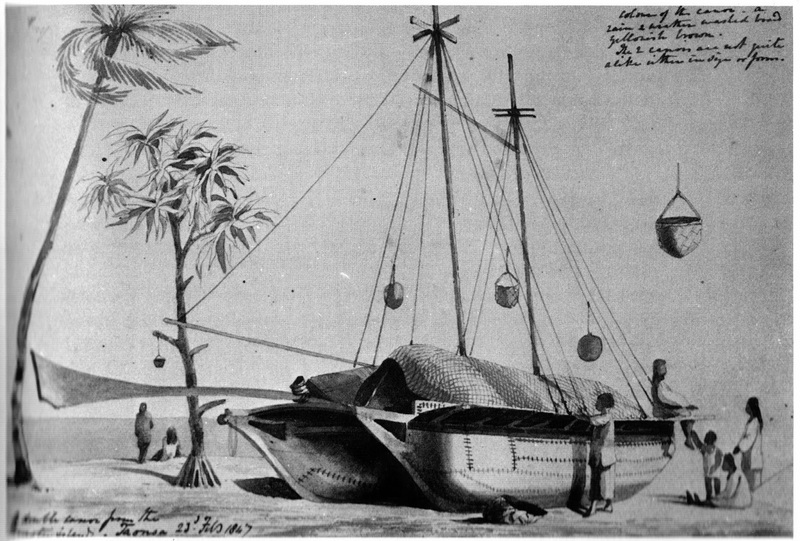 Grampus -- 50 guns, at Hawaii and on station in Tahiti and the Society Islands, 1846-1847.